Employment Shuttle is a program that brings together a group of 20 proactive and motivated unemployed people who, with the help of a coach, work as a team to encourage the labor inclusion of all members of the team. Employment Shuttle promotes social and labor inclusion of unemployed Internally Displaced People (IDPs) and host communities in Georgia, guides their career, and promotes the acquirement and development of necessary skills to foster their employability. The Employment Shuttle program was first introduced in Georgia in 2015 through Project LIFE Georgia, with funding from the European Union. When the program concluded in September 2016, 27 beneficiaries out of 40 were employed and 13 continued their studies. 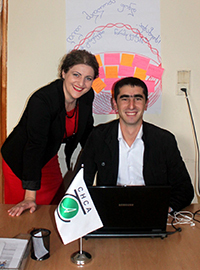 The Employment Shuttle methodology was originally launched by ACF (Action Against Hunger) Spain as the VIVES project, and was introduced in Georgia in 2015 through Project LIFE Georgia, with funding from the European Union. The project ended in September 2016, but because the program was so successful, the Municipality of Gori has continued to finance its continuation.